Published: July 3, 2012 at 01:58 p.m.
We have our second NFL arrest report to emerge during this holiday week. 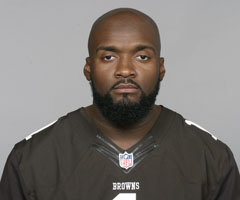 Police told WAGA-TV in Atlanta on Tuesday that Cleveland Browns defensive tackle Kiante Tripp was arrested on charges of burglary in College Park, Ga.
Tripp and two others are accused of threatening people inside of an apartment and then "ransacking" the place. Police told The Associated Press that Tripp and the men were arrested Sunday. Investigators also told the station that Tripp and the other two men were looking for a man and some money that allegedly was stolen from them. They reportedly had guns when they allegedly conducted the burglary. Tripp was an undrafted rookie last year but made the Browns' practice squad. He was promoted to the active roster in late November. UPDATE: Tripp was being held at Fulton County Jail in Atlanta. A jail representative confirmed that the defensive tackle is facing a charge of felony burglary. The second-year pro was still in custody on Wednesday afternoon and his bail was set at $15,000, according to a jail official. Browns general manager Tom Heckert told the AP that he is aware of the incident, but he declined to comment any further.